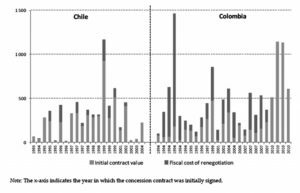 This paper analyzes the experience, high incidence, lesson learned and reflections on the issue renegotiations in Latin America, based in the evolution of PPP contracts through the last 25 years. The paper also shows how countries via new PPP laws, regulations, norms and specific platforms can reduce the incidence and the incentives to renegotiate contracts. Based in experience in the last two decades, many countries in the region have improved renegotiation practices and regulations/framework through their PPP legislation and associated regulations, such as Peru (2008), Chile (2010), Colombia (2011) or Mexico (2012.) The preliminary findings show advances in the implementation of platforms to address renegotiations and new trends in the renegotiations of contracts particularly in complex projects and where governments are providing financial or credit enhancement, such as sharing risk or co-financing. Over the last 25 years more than 6,0005public private partnerships (PPP) projects have reached financial closure in developing countries, this number, the benefits secured and the trends of the PPPs suggest that private participation in infrastructure has become a good and viable option to complement public investments for the development of infrastructure and the provision of public services. As well as, to support economic growth, improve quality of life and contribute to poverty reduction, and as an alternative to finance infrastructure. Figure 1: Number of PPP transport projects in developing countries by type and region (1984-2013). Source: Own elaboration with PPI Database data. The transport sector concentrates 25 percent of the total PPP contracts of the developing world. Three regions and countries lead this process: Latin America (Brazil), South Asia (India) and East Asia and Pacific (China), all large emerging economies with high economic growth rates. These 3 regions concentrate almost 90% of the PPP transport projects in the world in the last 30 years. About 78 percent of the total investment commitments in projects in the transport sector in the developing world in 2013 were concentrated by Brazil and India. By contract type, brownfield projects are predominant in transport PPP projects although the amount of these has had a fluctuating behavior associated with economic cycles, while the number of greenfield project has remained relatively constant the last twenty years. In general, brownfield projects are usually easier to implement than greenfield projects, which are more risky, complex and have more uncertainty in particular in traffic forecasting, in this context we should expect a greater proportion of potential contract renegotiations associated to greenfield projects. As well as, the low number of management contract can suggest the importance of the infrastructure gap in developing countries that has been tried to reduce mainly by a high number of build-operate-transfer (BOT) PPP projects. Figure 2: Number of PPP transport projects by type and year in developing countries. Source: Own elaboration with PPI Database data. A big legacy and a significant concern, of PPP contracts in Latin America (LCR) along the last 25 years is a very large number of renegotiations. Overall in the transport sector the incidence of renegotiated contracts is over 75 percent of the contracts. And in some countries the incidence, including repeated renegotiations of the same project is astonishing. For example in road PPPs, Colombia between 1993-2010 (Bitran et al, 2012 and Guasch, 2014) showed seven times the number of renegotiation in Chile or Peru, part of them associated to additional investments in infrastructure that were not included in the original PPP contract, suggesting poor project preparation studies critical to assess the real dimension/scope of the infrastructure projects, poor contract management and significant consented opportunism and abuse. In addition, as outcomes of the negotiation process, additional payment commitments increased the fiscal impact and reduced considerable the value for money of the PPP project, estimate on the basis of the original contract (Bitran et al, 2012). In this context, a poor project preparation studies by the government (scope of the project, level of investment, improper and ambiguous risk allocation, minimum requirements, selection criteria and PPP procurement procedures) and lack of effective contract monitoring can lead to potential contract renegotiation from both parties-public and private. Political reasons to accelerate the implementation of PPP projects with limited or lack of project preparation and proper filters (for example, without feasibility studies and proper evaluations by experts) can lead to consecutive renegotiations to accommodate the continuity of the PPP contract and the implementation of the contract commitments6. There is no reliable systemic data collected on PPP contract renegotiations. The most complete study is Guasch (2004 and updated in 2014) where it shows that between 1980-2002, 78% of the PPP contracts in transport infrastructure in Latin America were renegotiated with and fairly quickly after the signature of contract (3.1 years). Important lessons learned in PPP renegotiations in Latin American countries were accumulated and motivated Latin American countries to introduce key changes in the PPP legislation in countries with PPP experience (Peru, 2008 and Chile, 2010) and recently Colombia (2011) and Mexico (2012). The new regulations set ups a freeze for renegotiations for the first 3 or more years, clarifies risk allocation, compensations, rate of return, and states that any contract modification cannot alter the risk allocation matrix etc. Renegotiations also occur in other countries with large PPP experience such as France, USA or United Kingdom. While the ex-post contract award management of PPP projects is indeed critical for securing the expected benefits of PPP project, it has in general not been an important priority for governments or treated lightly or as a sort of residual to be taken care somehow. It is indeed surprising when noting that most PPP contracts have durations of 15-30 years, or for PPP in social sector which can involve more complexity, for example PPP in the health sector, where set up the level of services and its monitoring is a big challenge for governments. Issues do and will come up, and often not well specified or detailed in contract, in particular in dynamic markets where cost structure is changing aligned to the main drivers (for example, high prices of commodities) or the demands has increased over the expectations or level of services. All that creates opportunities for abuse and opportunism, and raise the likelihood of conflicts among the two parties quite significantly. The conflicts appear at all levels, i) Contract based, and ii) Beyond the contract through renegotiation. To some extent, disputes and differences in interpreting the contract are to be expected, and are part of the business as usual-but only those contract based and not on renegotiation (contract/risk modifications). Yet the incidence of both has been and is a concern particularly that of renegotiations. Renegotiations on average have been by and large the critical problem facing PPP. Given its implications on value for money and the legitimation of PPP over traditional procurement, there is a need to be prepared and to diffuse, pre-empt and address the issue. As is reported here a very significant number of PPP have been renegotiated shortly after the contracts have been signed. These renegotiations occur frequently in a short period of time after financial close (or even before). The problem is especially acute in some sectors, notably transport and the supply of water and sanitation. Most of renegotiations are initiated by private sector operators and to a lesser extent by the Government. Thus it is indeed critical to understand the issue, its causes and how best to address so as that PPP programs can generate its expected benefits. This is the challenge of this paper, which analyzes and evaluates the renegotiations paradigm during the last 25 years. II. Definitions: What is renegotiation? A renegotiation of PPP contracts involves a change in the original contractual terms and conditions, as opposed to an adjustment in the payments (or tariffs) that takes place under a mechanism defined in the contract. Those contractual changes as described below in Table 2. • Reduce the level of services (airports, from IATA A to B). • Defer or advance investments for several years. • Extension of the contract term. • Increase the guarantee of the government (to pay lenders). • Delays in the reduction of tariffs (tolls). • Reduce the thresholds of the economic equilibrium of the contract, etc. ii) a change in project scope (if this was not regulated in the contract). • Government requests new investments. • Reduction of fees for the government. • Ovoid bankruptcy of the operator. • Changes on the contract scope, etc. • Tariffs are adjusted with a formula set it in the contract or indexed by inflation or other index. • Triggers are activated and eventual investments become mandatory. • Payments to operator if they are regulated in the contract, etc. • Corrections of errors in the contract, which do not create obligations, commitments or contingencies (typos, contradictions that affect the implementation for the PPP contract, etc.). Table 2: Definition of renegotiation and examples. Source: Own elaboration. The challenge in “good” renegotiations is to improve the value for all parties, including users of the services, but accounting for possible fiscal consequences of the contract modification. Under a legal framework without restrictions, renegotiations can occur at any time after the PPP contract is signed. Usually the results of renegotiations are: improvement of the terms of the operator and / or investors, reduction of efficiency, reduction of quality for users and adverse fiscal impact, including increases in direct and contingent liabilities. Some have benefited the users, but they are a very small proportion of the renegotiated contracts. Regarding to the initiator of the renegotiation can be classified in: initiated by the government, initiated by the operator or concessioner, by both or ambiguous. When initiated by the government, the reason usually is because of change of priorities, change of government party or that the government cannot fulfill its contractual obligation, although politically opportunistic reasons also exist (in some cases, government wants to anticipate or expand investments , or to delay the increase or decrease tariffs to increase popularity prior to elections, etc.). On the other hand, when initiated by the private sector, renegotiations are due quite often to opportunistic reasons, seeking for maximizing the net present value of the PPP contract (more revenues, less costs or investments, or/and less risks), but also against shocks (domestic or external) that significantly unbalance the financial equilibrium. Table 3: Renegotiations classified in: initiated by the government, initiated by the operator or concessioner, by both or ambiguous. Source: Guasch (2004, updated 2014), Concesión y renegociar las concesiones de Infraestructuras hacerlo bien — Análisis de renegociar las concesiones en América Latina y el Caribe, mediados de la década de 1980 a 2010. • Asymmetric information and lack of negotiation skills of public sector and lack of competitive pressures to renegotiate the contract. • Distortion in public tender, in that the most likely winner is not the most efficient operator but the most expert/qualified in renegotiations. • Decrease the benefits/advantages of PPP and the welfare of users, and usually it has a fiscal impact by increasing liabilities to the government. • While some can be efficient, many of them are opportunistic. In the case of unsolicited bids, when there is only available bid is presented by the proponent, some PPP legislations allow governments to negotiate the contract conditions. Even this is not a formal renegotiation, the same challenges are present. Other PPP legal frameworks regulate a negotiation period after the contract is awarded, where under threshold the parties will agree on specific topics. • Time and financial resources: to address and resolve the conflict. • Social and Political: Since conflicts tend to be highly visible and have great coverage of the media, leading to disenchantment of citizens, the PPP model tends to lose credibility and public support, and the government can be weakened. • Financial/Fiscal: Often the results of the negotiation have a fiscal cost to the government. On average, these costs are quantified as 3-15% of the investment, the impact and uncertainty of the results of the conflict resolution can be quantified as adding 2-4 points percentages on capital cost of the project. i. 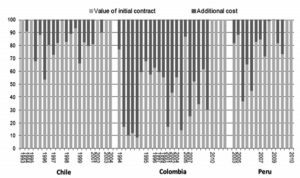 Overall Incidence of Renegotiated Contracts in Latin America and Caribbean. Since 1990 to 2013 more than 1,700 PPP projects have reached financial closure in Latin American countries, one country (Brazil) concentrate 41 percent of the total PPP contracts. As the projects become more complex usually an increase on the government’s support is needed. In Latin America, between 2000 and 2007 an urged increase on the government support to PPP projects occurred, including transport infrastructure followed by a sharp decline after the global financial crisis. Figure 3: Projects with government support. Source: Own elaboration with PPI Database data. The increase in the complexity of PPP projects might suggest more renegotiation incidence; but on the other hand, the countries with PPP experience have improved their renegotiation regulations in their PPP legislation, which intends to reduce incentives and manage renegotiations with better structure and oversight. As shown in Table below the incidence of renegotiation continues to be significantly large, averaging 68% overall and 78% in transport infrastructure, and also are done relatively quick after contract award, about one year after (between 1980 and 2000, was 3.1 years, Guasch, 2004). The sectors most commons continue to be transport and water and sanitation. Yet social sector PPP are picking up. Cancel or Renegotiate contracts. Governments with weak institutions face a crucial tradeoff between the cancellation and renegotiation of a PPP contract to avoid, for example a potential bankruptcy. The number of cancelled contracts in Latin America is low but increasing in the last 30 years, about 5 percent of total PPP projects granted as shown in Table 5 below. This rate is slightly higher than the average for developing countries (4.3%) . When it is contrasted with the number of renegotiated contracts, it strongly hints to the difficulty of governments to commit to a policy of no renegotiations and assume the political consequences of cancelations of PPP projects. One would expect that number to be significantly large, particularly at the begging of programs, where the Governments could signal by rejecting the request, to a credible policy of no renegotiations. Yet governments when confronted to renegotiations can have the option to deny the request and leave the decision to abandon or not the concession to the private operator. Yet that seldom happen, and for a number of reasons that we detail below, governments find it easier to allow the renegotiation of contracts (Harris and Pratat, 2009). And that leads to a vicious circle, since private operator understand the difficulties of government to manage the PPP program, their inability to cancel contracts, to reject renegotiations requests and the political consequences. Table 5: PPP contracts cancelled 1984-2013 in LCR (no divestitures). Source: Own elaboration with PPI Database data. ii. Specific Examples in Latin America: Renegotiations in Chile, Colombia and Peru. 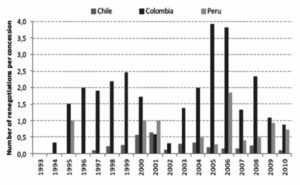 Here we show the evidence of renegotiations in three Latin American countries, Chile, Colombia and Peru for the period 1993 to 2010. It shows a significant incidence of renegotiations of PPP road contracts, a significant incidence of renegotiations of the same contract, and substantial fiscal costs of the outcomes of renegotiations. Colombia shows an important fiscal impact, in particular between 2005 and 2006. *Over the life of the contracts, across all renegotiations. Figure 4: Number of concession renegotiations per year in each country. Source: Bitran et al 2012. The trends on PPP road contract renegotiations in Chile, Colombia and Peru shows (see Table 7) the leadership of the government motivating renegotiations, most of them during the construction stage that suggest poor project preparation on the scope and conditions of the infrastructure and with important fiscal costs. Table 7: Characteristics of contract changes, 1993-2010. Source: Bitran et al 2012. Figure 5: Additional cost versus initial contract value (%). Source: Bitran et al 2012. Figure 6: The fiscal costs of renegotiations in Chile and Colombia (Constant prices in millions USD December 2009). Source: Bitran et al 2012. That high incidence of renegotiations is not privy to the LAC Region. It also happened outside the Region, cases in point are the experiences of India, Portugal and Korea8, among others. India launched in the lid to late 2000s an aggressive program of PPP particularly in the road sector, awarding over 300 highways PPP. Many of them with the support of the Viability Gap Fund, often awarded under the criteria of minimum subsidy requested. As of 2014, more than half of those projects are in distress with the private operators requesting renegotiation of the contract. Apparently, a significant number of those renegotiations demands originate from aggressive bids. The Government of India has been evaluating the situation and prepared a response for this systemic problem, but in a selective and case by case basis. Overall its approach has been to reject most of the request. All PPP projects to be developed were paralyzed, affecting several sectors were paralyzed, 2011-2012. The Ministry of Finance (MoF) and the International Monetary Fund assessed the PPP legal and institutional framework in a new PPP framework law and UTAP created (June 2012). MoF updated and enhanced its reporting instruments on PPP and concessions. Ernst & Young was hired for the assessment of the PPP renegotiations. • The road model is not sustainable for the public partners (EP) party. • Renegotiation will provide more rational contracts and remuneration schemes. • No debt renegotiation is undertaken: any debt renegotiation would increase financial costs of contracts. • Financial institution would increase financial costs of: only transitory ADSCR reduction from 1,25 to 1,05. Additionally, toll revenue related measures. Target for 2013: 300 million (IRRCAPEX). Amended contracts did not entry into force in 2013, pending financial institutions and Court of Auditors approval. Table 8: Portugal renegotiations case study. Source: Own elaboration. Overall indicators show as of 2013 an increase in the average of renegotiations relative of the levels in 2004, a significant increase on average in the number of renegotiations per concession/PPP and a decrease in the incidence of renegotiation in selected countries that have implemented measures to address the issue. The renegotiations requests can have multiple causes, external and/or internal. Some examples associated mainly with external drivers are: i) significant changes in economic circumstances. In regulated markets where no prices can be adjusted unilaterally by the private operator, frequently lead to renegotiation requests, either by the operator or the Government (even if the risk allocation is established in the contract); ii) Occasionally, economic conditions change unexpectedly because of the macroeconomic conditions beyond of the control of the parties (e.g. financial crises worldwide, the fluctuations of currencies) break the bankability of the project and induce renegotiations requests; iii) Unforeseen natural events or disasters that require emergency interventions or investment. Among the most common internal drivers for demands for renegotiation are: i) elections where the new administration can change the regulation and contract terms and affect the operator rights, etc. ; ii) new demands of users over the original level of services (in particular in the first generation for roads and airports); iii) bidding errors, aggressive offers, and poorly written contracts and ambiguous risk allocation; iv) breach of contractual obligation by government (land expropriations process can take long time and not be available on time), lack of bankability of the project (misperceived risks) and lack of preparation studies (that increase construction risk); v) opportunistic behavior by operators and governments (governments may decide to modify the contract in benefit of users acting unilaterally to capture electoral votes, or newly elected government changing priorities to modify or expand investments after elections); vi) the opportunity of governments to bypass the fiscal controls to secure additional financing and avoid authorization (by parliament) for additional investments; vii) the inability of Governments to credibly commit to a policy of no renegotiations leads to the abuse of renegotiation requests; and viii) the operator’s perceived leverage to influence the host government to grant them additional benefits through the renegotiation and weak contract monitoring. VII.Platform for Addressing Renegotiations and Measures that have been taken to tackle this issue. A number of countries have taken measures to address the issue with mixed success, mainly as the result of not implementing a coherent and comprehensive renegotiation platform along the lines shown below. Here are some of the normative measures implemented by some countries. Table 9: Measures that have been taken in some countries to address the renegotiations issue. Source: Own elaboration. • The contract should stipulate the renegotiations approach, criteria and process. • Increase the political costs of accepting renegotiations demands, by implementing a Transparency Framework-Use of Web, publish the requests, decisions and arguments, and using the media to inform on request and decisions and rational. Use and implementation of “delivery unit” to high level to resolve impasses in the preparation of projects/contracts. • Establish a freeze period for renegotiations; say no renegotiations will be considered for three to five year after contract award. Only few exceptions can be accepted (Peru and Colombia). • Establish clear jurisdiction over the decision to renegotiate, at high level, such as Interministerial Committee lead by Minister of Finance (Chile and Peru). • Establish in the contract the right to evaluate and reject aggressive and reckless bids, defining the criteria and standards, including submission of financial model for those bids or additional guarantees (financial bonds). • Establish transparent framework of conflict resolution (panel of experts and arbitration). Using proper panels of experts (which composition based on technical profile and selected at random from pool of experts) to address issues such as aggressive bidding, renegotiation requests, arbitration, regulation-resetting tariff structure. • Establishing a matrix of risks with detailed risks identification and allocation-establishing that modifications of the contract must not alter the risk allocation. A statement in the law or regulations that the risk matrix cannot be altered (Mexico). • Clarification and wording of key contractual clauses and biding documents. • Putting in place a platform for efficient land expropriation and for the securing of rights of way (Mexico and Chile). • Establish guidelines for levels of compensation. • Use appropriately the selection of competitive factors (such as the award criteria) to increase the costs – make more expensive the exit. When possible use as award criteria (for some sectors) the least present value of revenue, as it is quite robust to mitigate renegotiation requests (automatically extending the duration of the contract if economic conditions become adverse, Chile and Colombia). • Greater role of the regulator and PPP Unit in the design of contract and regulation of the contract (Peru, Colombia). • Disuse of clause of financial equilibrium (Chile and Peru). • Platforms of renegotiations and process led by the Ministry of Finance (Chile and Peru). • Use of regulatory accounting (Peru and Chile). • Transparency of the renegotiation process. Disclosure of information since the request, analysis, negotiations and final amendment- web information. Greater use of LPVR as the award criteria to mitigate demand risk (Chile en Colombia). Finally some reflections about the issue of renegotiations of PPPs. There are indeed valid reasons to renegotiate PPP contracts and some incidence is to be expected as a result of a number of things, such as incompleteness of the contract, the long duration of the contract/project, the likelihood of unforeseen events with significant economic/financial impact, the likelihood of changes in priorities by conceding governments and so on. Yet the observed high incidence of renegotiations is a serious concern, a source for criticism and for the questioning of the effectiveness of PPP programs. It indicates an abuse of the instrument and its use for opportunistic reasons rather form well founded contractual ones. The benefits of PPP programs have been extensively proven over the 25 years of PPP experience in Latin America (Guasch 2004, 2012). Yet to sustain the programs and to secure the expected benefits, the issue of renegotiations (which outcomes generically reduce the original contracted for benefits) needs to be addressed and is the major weakness of PPP programs. As presented here the key principles to guide country initiatives to address renegotiations are as follows. When government are confronted with requests for renegotiation, the sacred character of the original contract/bid must be respected to preserve the value for money of the original contract, and the contractual or bid offer must not be breached The operator should be held responsible for its offer and risks accepted in the contract. The financial equation of the winning offer should always be the reference point, and if the contract is to be modified, the outcome should have an impact of zero net present value of the benefits, and the contract modifications should not change the original risk allocation matrix. Renegotiation must not be used to correct errors in the bid or excessively risky or aggressive bids. Bitran Eduardo & Villena Marcelo (2012) Benefits and Costs in Public Private Partnership: Transport Infrastructure Projects in Latin America. Facultad de Ingeniería y Ciencias, Universidad Adolfo Ibáñez. Bitran E., Nieto-Parra S. and Robledo J. (2012) “Opening the black box of contract renegotiations: An analysis of road concessions in Chile, Colombia and Peru” Draft Renegotiations in Chile, Peru and Colombia, Mimeo. Guasch, J. L., J.J. Laffont and S. Straub (2007) “Concessions of Infrastructure in Latin America: Government-led Renegotiation”, Journal of Applied Econometrics 22, p 1267-1264. Guasch J.L., J-J Laffont and S. Straub (2005) Infrastructure concessions in Latin America: government-led renegotiations, World Bank Policy research Working Paper 3749. Guasch, J. L., J.J. Laffont and S. Straub (2003) “Renegotiation of Concession Contracts in Latin America”, Policy Research Working Paper 3011, The World Bank, April. Harris, Clive, John Hodges, Michael Schur, and Padmesh Shukla (2003) Project Infrastructure a review of Canceled Private Projects., World Bank, Note Number 252. Harris, Clive and Pratap Kumar (2009), What drives private sector exit from infrastructure? Gridlines. Note 46. PPIAF. Huamaní Sandro and Vargas Tito (2011) Renegociaciones no eficientes a partir del diseño del contrato y la licitación en las concesiones en transporte. Revista de Regulación en Infraestructura de Transporte. Number 7.OSITRAN. Montesinos Jorge and Saavedra Eduardo (2011) Algunos alcances en torno a la institucionalidad y renegociación de concesiones en la infraestructura de transporte de uso público en Perú, Revista de Regulación en Infraestructura de Transporte. Number 7.OSITRAN. OECD Development Center (2012). “Latin American Economic Outlook”. Paris: OECD Development Center. UTAP, (2014), Renegotiations of PPP Concessions in Portugal, Power Point Presentation. Table 1: Percentage of renegotiated contracts by region and sector. Table 2: Definition of renegotiation and examples. Figure 3: Projects with government support. Table 4: Percentage of renegotiated PPP and average time to renegotiation. Table 5: PPP contracts cancelled 1984-2013 in LCR (no divestitures). Table 6: Summary of sample statistics by country, 1993-2010. Figure 4: Number of concession renegotiations per year in each country. Table 7: Characteristics of contract changes, 1993-2010. Figure 5: Additional cost versus initial contract value (%). Figure 6: The fiscal costs of renegotiations in Chile and Colombia (Constant prices in millions USD December 2009). Table 8: Portugal renegotiations case study. Table 9: Measures that have been taken in some countries to address the renegotiations issue. Professor of Economics, University of California and San Diego and former Head of the World Bank Global Expert Team of PPP. Senior Economist at the World Bank; Lincoln Flor, Senior Transport Economist at the World Bank. Transport Operations Analyst at the World Bank. For example, in 2005 3 PPP roads (Interoceanic 2, 3 and 4) were awarded in Peru without cost-benefit analysis. The governments approved avoid this important step. In 2006, a third amendment was signed to allow the financial close of the projects. As well as, in 2009 and 2010, based in the global financial crisis, the government decided to avoid or relax the cost-benefit analysis and reduce the filters (value for money analysis was postponed during these years) and the deadlines during PPP project preparation, for a selected group of candidate projects. If only one valid bid was received, and the winning bidder doesn’t want to sign the contract, unless there is a commitment to renegotiate later, this behavior can be associated to an aggressive bid. If institutions are weak and cancelation for the PPP process can affect the PPP program or have political consequences, this context can incentive more aggressive bids. Even, in the case that contract is signed or the government decides to reject the renegotiation conditions, the contract has to be cancelled and the PPP project has to be rebid, under a new procurement process and the political promises to develop infrastructure and deliver services will affect the credibility of the government, and there is no guarantee of more competition under a new PPP process. In political terms, the whole PPP program can be affected or delayed.